The EIPL desiccant dehumidifiers all incorporate the well proven, Proflute / Munters desiccant wheels thereby ensuring their products, as a minimum, equal performance to major competitors products. 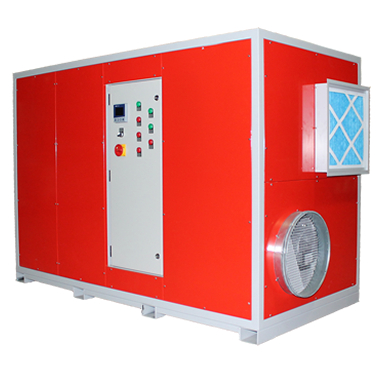 This range of large desiccant dehumidifiers, have been designed to accommodate a wide range of regeneration heat sources, ie electric, steam and gas, thereby ensuring a wide variety of installations are accommodated. The programmable electronic controller, and high capacity EC process fan, allows easy installation and also the flexibility for the end user to fine tune drying capacities catering for, high extraction, high efficiency or deep drying, depending upon the final application. Facility for an external humidistat allows remote control of the drying cycleAll models incorporate a high efficiency patented PPS Rotor. This design incorporates an 82% active Silica Gel to ensure optimum performance over the equipments wide operating range of environments. All desiccant rotors supplied by EIPL are washable, and designed for high performance / long life. The chassis design incorporates access points for fork lifts and pallet trucks, allowing for easy maneuvering into awkward site locations. All side panels are removable, allowing for easy servicing and maintenance. Should a fault arise various fault indicator lamps allow easy diagnostics and thereby minimum downtime.